Are you facing any indexing problem with your website or blog? Sometimes Google spiders may not index our web pages and blog posts irrespective of whatever efforts we do. Google will not show any unindexed web pages in Search results. It is important to make sure Google has indexed all pages on our website. What can we do if Google is not indexing pages on a website? This article explains the steps to force the Google Search Engine to index any pages on a blog or website. It is an unfortunate situation for a webmaster where Google shows no interest in his blog and no longer crawled. Next step he can do is to force the search engine to crawl his blog. How can he force a Search Engine to do it? Is there any manual steps or procedure to force Google to index his blog posts? Webmaster-tools provides a method to submit any pages from a registered domain. If Google has not indexed a specific page or post on our website, we can submit that URL directly using webmaster tools. Spiders will come to index that URL after we submit the link. Let us check the manual procedure to submit a URL to index using Google Webmaster tools. Here I have submitted one of my blog posts which is not yet indexed. 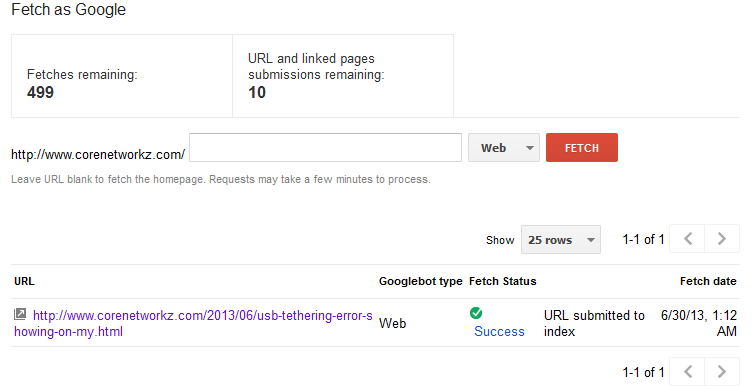 A successful submission shows the message, URL submitted to index, with a success tick. Even though you have completed the process, its Google's decision to make whether to index that URL or not. You have learned how to index your blog post manually by using your Webmaster tools account. Similarly, webmaster tool helps to optimize the crawling rate of spiders on websites and blogs. 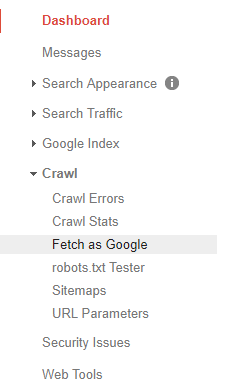 We can specify the rate of crawling from webmaster tools. To learn more about setting the indexing speed, click on the link below. We can use Webmaster Tools account to see how Google view our blogs. Webmaster-tools provides the facility to change the default settings about indexing rate, Spider visits, submit sitemaps, etc. Another facility in the webmaster tools account is to check the indexed links pointing to our websites. To learn more about it click on the link below. If you have added a custom domain name for your blog, Google may take time to index all the pages on it with the new address. In this case, you can use the facility offered in Webmaster tools to index URLs even though Google is not indexing it automatically. Do You Use nofollow Attribute? Though the result is not guaranteed, it is the one of the best manual procedure to submit a post link and ask to start the indexing process. To learn more about the procedure to add a custom domain to a blogger blog, follow the instructions provided in the link below. I believe that it is vital to check that every pages on our site and blogs are indexed by Google. Thank you for teaching us on how to submit a URL to index in Google manually."